The Etruscans lived in and around Tuscany (which is named after them) in Italy prior to Roman expansion. Unlike most well known European peoples they did not speak an Indo-European language which is probably the main reason why scholars have speculated so much about their origins. There are two main theories, both of them with ancient proponents and modern defenders. Some say they came from Asia Minor, others consider them indigenous to their homeland in Etruria. There is a third possibility that is seldom mentioned. In late prehistory, much of northern Italy was characterized by the Villanovan culture and since there is no discernable break in the archaeological record and the territorial correlation is almost perfect, it seems most reasonable to assume that people speaking early Etruscan were prominent within this culture; an argument often made by the proponents of the indigenous theory. However, the origins of the Villanovan culture are linked with the Urnfield migrations (ca. 1300-1100 BC, see Axel Kristinsson, 2010, chapter 2) when strong influences from the eastern Alpine region appeared in northern Italy. Most scholars seem to think that the carriers of the Villanovan culture were Italic speaking newcomers from Central Europe and that the Etruscans either came later (from Asia Minor) or were the indigenous population who’s language eventually prevailed. Neither solution explains the remarkable correlation between the territories of the Villanovan culture and the Etruscan language and it is far simpler to assume that the Etruscans themselves brought the Villanovan culture to Italy. Just because the Etruscans didn’t speak an Indo-European language doesn’t mean that they couldn’t have migrated from Central Europe. In fact, the poorly documented Raetian language of the eastern Alps, still surviving in Roman times, may have been closely related to Etruscan and would represent a residual population close to, or in the region where the Etruscans came from. 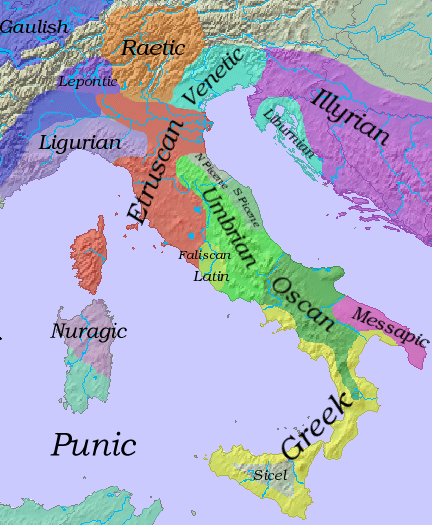 Many scholars accept a Tyrrhenian (or Tyrsenian) language family including Etruscan, Raetian and Lemnian. The latter was spoken on the Greek island of Lemnos in the Aegean and was clearly related to Etruscan. Thucydides (IV, 109) mentions other small pockets of Tyrrhenians in the Aegean (in Attica and Acte) and the Greeks also applied this name to the Etruscans although some authorities believe that the term was used indiscriminately for non-Greek speakers. These Tyrrhenians in the Aegean may be a residue from the great Urnfield migrations (above). This was a time of catastrophic collapse in Greece and Anatolia and of widespread troubles in the Near East. The root cause was probably an expansion cycle coming out of the Carpathian basin (Axel Kristinsson, 2010). This expansion may have involved several peoples speaking diverse languages and manifested itself in the spread of the Urnfield culture in Central Europe. It probably also brought speakers of Phrygian to Anatolia and Dorians to Greece. This was also the time of the Sea Peoples who ravaged the eastern Mediterranean. Their origins are mysterious but they included several named ethnicities such as the Teresh who some have suggested were of Tyrrhenian (Tyrsenian) stock. We can perhaps reconstruct the chain of events something like the following. 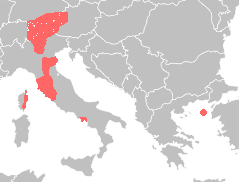 Prior to the Urnfield expansion, which started around 1300 BC, a Tyrrhenian speaking population lived in the eastern Alpine region and some western parts of the Carpathian Basin. The expansion cycle caused large numbers of them to migrate. Most of the migrants would have gone to Italy where they created the Villanovan culture and introduced the Etruscan language but those that stayed close to home were later known as the Raetians. Some would have taken to the sea in the Adriatic and become part of the Sea Peoples and as such wrecked havoc in Greece and the Levant. The Aegean Tyrrhenians may be a residue from such maritime migrations although it also seems possible that they came overland, through the Balkans, and only took to the see as they entered the Aegean. If the Tyrrhenians originally came from the Carpathian Basin and the Alpine region they might very well be the descendents of the first farming culture in Central Europe the Linear Pottery culture (and its successors Lengyel, Baden etc.). Once in Italy, the Tyrrhenians interacted with Italic speakers. A linguistic map of Italy prior to Roman expansions shows the distribution of the two main groups of Italic languages: the Latino-Faliscan and the Osco-Umbrian. It is poorly understood how the Italic languages were brought to Italy from Central Europe but the distribution and the two different branches might suggest that they came in two waves. The first wave may have come to Italy several centuries before the Urnfield expansion and brought with it the dialects that were to form the Latino-Faliscan branch. During the Urnfield expansion, the Etruscans came and settled large parts of northern Italy. Finally, the second wave of Italic speaking migrants descended upon Italy, probably also during the Urnfield migrations. These spoke dialects of the Osco-Umbrian branch and pushed the Etruscans to the west and absorbed most of the earlier Italic speakers. Only those Latino-Faliscan speakers living on the southern border of the Etruscans survived, presumably because here, they were sheltered from the full force of the invasion. Later on the Venetic speakers entered the extreme northeast of Italy and the Etruscans, in their own expansion cycle (Axel Kristinsson, 2010, pp. 112-114), spread out in the Po valley and elsewhere. This entry was posted in History and tagged Etruscans, Italy, languages, prehistory on January 13, 2014 by Axel Kristinsson.